Opportunity cost is the value of an activity forgone to participate in some other activity. With respect to surgery, an innovation incurs an opportunity cost when it uses additional operating time that could otherwise be used in a productive way. Although fundamental to the economist’s view of costs, opportunity cost is infrequently used in the laparoscopic literature. In an environment of limited resources, providers must understand opportunity cost and apply it to the assessment of new technologies. We present an example of assessing opportunity cost in the transition from open to laparoscopic colectomy using pooled analysis data from the surgical literature and hospital financial data. Using an OVID/MEDLINE search of English language journals between the years 1998 and 2008, we identified studies from which we pooled data related to costs and operating room times for laparoscopic versus open colectomy. The weighted mean differences for these variables were calculated using inverse variance weights. Where appropriate, standard deviations were imputed based on reported p-values or confidence intervals, following the guidelines outlined in Cochrane Handbook for Systematic Reviews of Interventions. Using our university hospital 2007 financial records, we then identified the five most frequently performed, elective general surgery procedures. Their profit margins were determined and then divided by their average surgical time in order to calculate a range of opportunity cost multipliers. 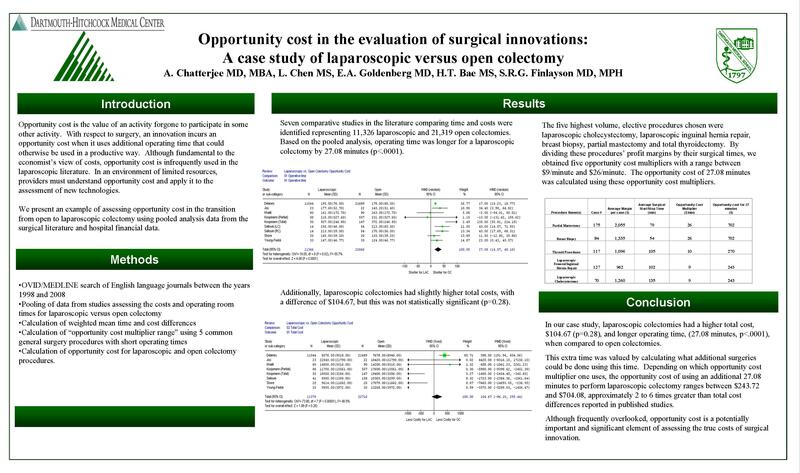 We then applied these opportunity cost multipliers to the additional time required to perform laparoscopic colectomy (versus open colectomy) to demonstrate that procedure’s true overall cost.